I am Director of Student Media at the Manship School of Mass Communication at Louisiana State University. I started at LSU in July 2014 as the Lamar Family Visiting Scholar. In addition to teaching and leading LSU Student Media, I work with students on a social media project funded by a grant from the Knight Foundation. In the fall of 2016, I am teaching Media Writing. Earlier courses I have taught include Introduction to Mass Media, Learning Interactive Storytelling Tools and Advanced News Gathering. Georgetown University. I team-taught Entrepreneurial Journalism (fall 2010 and scheduled for spring 2014) and Social Media and Reporting (summer 2011 and 2013) for the Master of Professional Studies in Journalism program at Georgetown University’s School of Continuing Studies. I led two one-day workshops: Job-Hunting in the Digital Age (spring 2011) and Accuracy and Verification (fall 2011). I was a faculty adviser for one student’s capstone project and served on the faculty assessment panel for other capstone projects (spring 2011). American University. I taught Disruption and Opportunity in the Media (spring 2011) for the Interactive Journalism master’s degree program at American University’s School of Communication. I consulted on curriculum plans for a new MA in Media Entrepreneurship program and have been a guest speaker for an entrepreneurship class. I also was a panelist in AU programs on making the most of your internship and career planning and spoke at a boot camp for new graduate students. University of Iowa. I team-taught Creating an iPhone App (spring 2010), a joint project of the University of Iowa’s School of Journalism and Mass Communication and Department of Computer Science. Kirkwood Community College. I taught Using Social Media for Business and Getting Started in Twitter (both fall 2009) for the Continuing Education program of Kirkwood Community College. Central College. I taught Reporting and Editing at Central College twice in the winter quarter, 1980-81 and 1982-83. News University. This is more a professional teaching school than a traditional university (though lots of J-schools use it). I developed one of the original News U courses (Beat Basics and Beyond) and updated it in 2011 (renamed Introduction to Reporting). More than 10,000 students have taken the course. As part of the successful accreditation process of the Schieffer School of Journalism at Texas Christian University in 2009, I consulted with the curriculum committee, offering my advice on updating the curriculum. I was a panelist for the Accreditation Council on Education in Journalism and Mass Communication as it considered updating accreditation standards for journalism schools. I was a faculty member and keynote speaker for the Journalism, Leadership and Management Conference hosted by the Iowa State Daily in June 2013. I was a guest speaker for the Management Seminar for College Newspaper Editors at the University of Georgia’s Grady College of Journalism and Mass Communication. I consulted with TCU in 2012 about efforts to develop a digital-first approach for student media. Later in 2012, I returned to lead some digital-first workshops for student media leaders. I also led digital-first workshops for student media at the University of Texas at Arlington in 2012. 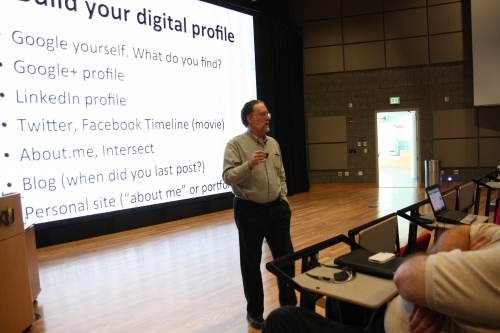 I was a keynote speaker at the Future of Student Media Summit at Ohio University in 2016. American Institute of Business; Arizona State University (four times); Cal Poly Pomona (twice); California Polytechnic State University, San Luis Obispo (in person and via Skype); Cal State-Fullerton; Carleton University; City University of New York Graduate School of Journalism; Columbia University (three times); DePaul University (live Twitter chats twice); Drake University (twice); Eisenhower School for National Security and Resource Strategy (twice); Emory University; George Mason University (four times); George Washington University; Harvard University; Indiana University of Pennsylvania; Industrial College of the Armed Forces, National Defense University, Fort McNair, Washington, D.C.; Iowa State University (four times); Iowa Western Community College; Ithaca College (Skype); Johnson County Community College; Kansas State University; Loras College; Marymount University; Metropolitan Community College, Omaha, Neb. ; Minot State University; Northern Illinois University; Northern Kentucky University; Northwestern University; Ryerson University (five times); Santa Clara University (group visiting Washington); Savannah State University; Stanford University; Syracuse University (in person and via Hangout); Temple University; University of California-Berkeley, Knight Digital Media Center; University of Central Lancashire (twice via Skype); University of Colorado (twice); University of Georgia; University of Iowa (three times); University of Kansas (twice); University of Kentucky; University of Maryland; University of Minnesota; University of Missouri (five times); University of Nebraska-Lincoln; University of Nebraska-Omaha; University of Nevada Reno (live twice and via Skype); University of North Carolina, Reese Felts Digital Newsroom; University of North Dakota; University of Oregon Emerald Media, telephone consultation; University of South Carolina (live and via Skype); University of Southern California (live and via Skype); University of Texas at Arlington; University of Western Ontario (via Skype); University of Wisconsin-Eau Claire; Washington and Lee University, visiting Washington; Yale University. For more details, check my CV or my video appearances.